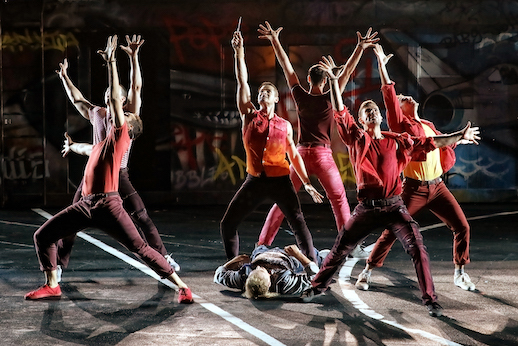 Click HEREto read Man in Chair’s review of West Side Story in Melbourne. Director Francesca Zambello operates under the old truism if it ain’t broke don’t fix it, avoiding any temptation to impose some sort of “concept” and simply allowing the inherent quality of the time honoured Broadway classic to speak for itself. Lovers of West Side Story will thrill to the spectacular design, sensational dancing and gorgeous singing, all performed by a massive cast of 40. 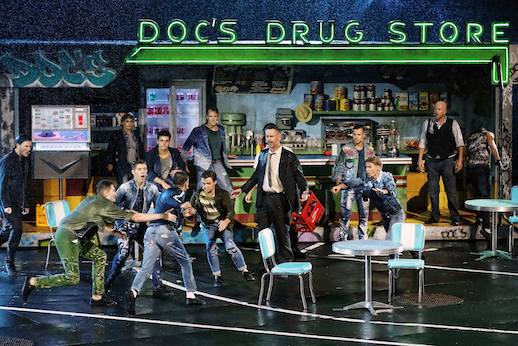 An extraordinary piece of musical theatre when it premiered in 1957, recent productions of West Side Story have reached new heights thanks to the onset of arts training institutions. A glance at the cast biographies reveals the extent to which higher training is a common expectation for the musical theatre stage. Filling the company with trained triple threats means that not only can Leonard Bernstein’s songs be heard at their best and Jerome Robbins’ recreated choreography look dazzlingly sharp, but also the stage is filled with impactful, authentic character work. While the design has something of a timeless feel, Zambello ensures that the performers are imbued with the lively 1950s zeitgeist created by book writer Arthur Laurents and lyricist Stephen Sondheim. The concept of kids who are playing out of their depth is clearly transmitted, heightening the inevitable tragedy that the audience can only watch with helpless defeat. In particular, having Anita as a younger, more vulnerable character makes the taunting scene all the more harrowing. Zambello brings out rich character detail in roles such as Baby John (Oliver Lacey), Diesel (Rubin Matters) and Anybodys (Luca Dinardo), to name just a few. Well experienced at utilising the vast space of the Harbour stage, designer Brian Thompson crafts a visually striking streetscape decorated chiefly with graffiti. The two halves of the Jets and Sharks’ turf are designated with street art (literally, a shark and a jet) as well as the characters’ names being tagged on walls. A giant scrawling of “Go Home” brings the xenophobic immigration culture clash at the heart of the show hurtling into the present day. The scale of production gives a sense of actual location for the story. On opening night, mother nature reminded us that the gang members exist on the street by delivering a heavy downpour of rain. Looking for a silver lining, John’s Rayment’s richly coloured lighting looks even better when reflected from wet black asphalt streets. Jennifer Irwin’s costumes balance authenticity with theatricality to attractive effect. Dressing each cast member individually, the Jets’ sport shades of blue and indigo in chambray and denim while the Sharks flash a range of the fiery colours of red, yellow, purple and orange. The individuality of the costumes strongly supports Zambello’s character work with the talented cast. Maestro Guy Simpson works his magic with Bernstein’s fiendishly complex score, delivering exciting rhythms and crisp vocal harmonies. Sound engineer Des O’Neill ensures that the intricate work of 29 players in the orchestra is delivered with balance and clarity, the overall sound quality suiting a musical much better than it usually suits an opera. Of all the creative aspects, the one that is going to most impress audiences is the brilliant choreography. In fact, the standard is so high that many audience members may simply take it for granted. Not only are the cast members performing on a steeply raked stage, and possibly in the rain, but the wide stage area creates an additional challenge of having to move much further and faster than in a traditional proscenium arch theatre. Choreographer Julio Monge has done a sterling job of respectfully recreating Robbins’ iconic choreography whilst also expanding it for the large cast and even larger space. 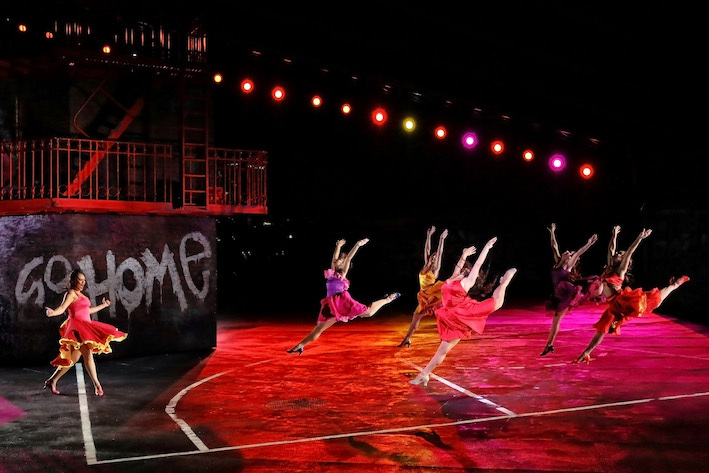 The terrific result makes this season of West Side Story a must-see for lovers of stage dance, not just for lovers of musical theatre. 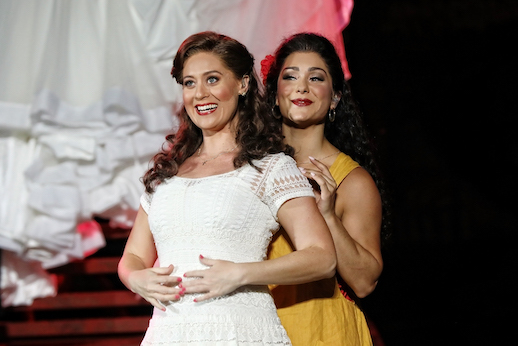 Opera Australia has presented several musicals over the past few years, but this is the first time that the lead performers have also sung operatic roles for the company. Alexander Lewis plays the role of Tony with earthy charm, singing with an easy, comfortable sound that steers clear of operatic tendencies. As fine a singer as he is, Lewis impresses even further with the strength of his acting, delivering Tony’s dialogue as if it is being spoken for the first time. Having already played Maria in the 2010 Australian tour of West Side Story, soprano Julie Lea Goodwin takes her performance to the next level, singing with heavenly sweetness, and acting with an expertly judged balance of innocence and burgeoning sexuality. Goodwin and Lewis enjoy strong chemistry and sound wonderful together in duets. Breaking with custom, Goodwin, as Maria, sings the dreamy ballad “Somewhere,” a choice that has evidently been made due to the sheer loveliness of her vocals. Mark Hill is a sensational Riff, bringing an electric masculine energy, dancing superbly and singing up a storm. A vibrant singer, Karli Dinardo is an unusually delicate Anita, and the role is all the more interesting for this. Puerto Rican ballet/musical theatre performer Waldemar Quinones-Villanueva brings a spiky sensuality to Bernardo, a role he dances with dynamic bravado. Of the four adults, Scott Irwin particularly impresses with his unflinching delivery of the ugliness of Lt. Schrank’s vitriolic racism. 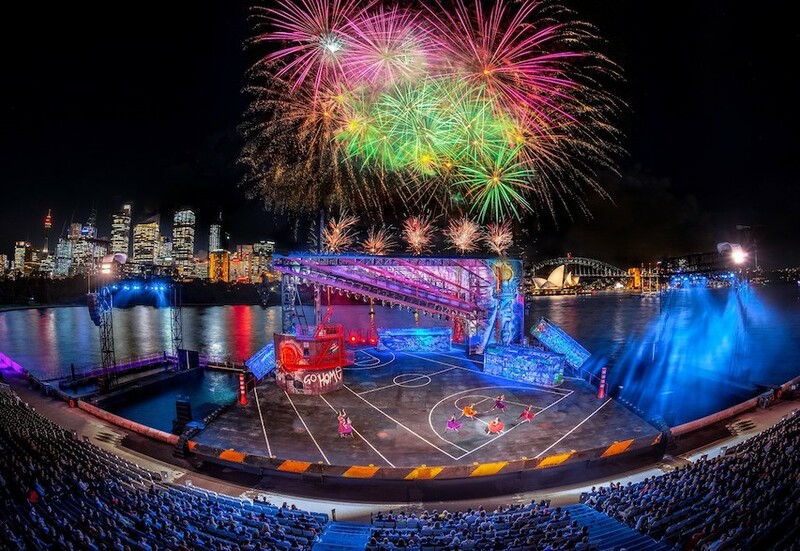 An event in itself, Handa Opera on Sydney Harbour is all the more accessible this year with this popular choice of show. West Side Story is produced and performed to the highest quality, and attendance is highly recommended. 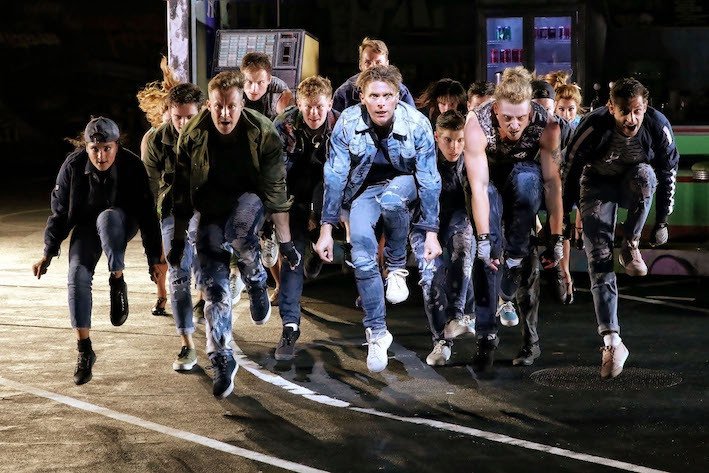 Handa Opera on Sydney Harbour: West Side Story plays at Fleet Steps, Mrs Macquaries Point, Sydney until 21 April 2019. Catching this soon Simon so your review has peeked my anticipation….thank you. Are they using alternative casts on consecutive nights ? 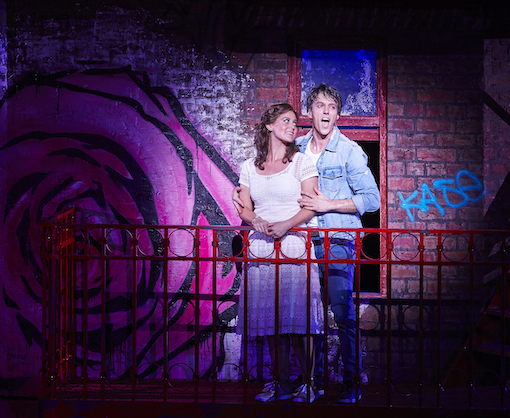 Unlike the previous opera seasons on the harbour, they are using the same cast every night for West Side Story. The only aspect to check is the weather! What an amazing production on every level. The vocals were sublime, especially the Act 1 Tonight quartet. I expected a few fireworks for Tonight’s “shooting sparks into space “….lol ! I noticed that the ending differed from the classic ending we have become used to and listed in the programme plot notes. Looks like it may have changed during the rehearsal process ? Was Tony carried off in the original stage production or was it changed for the film ? Any inside clarification on this discrepancy would be great Simon. So glad to hear you enjoyed West Side Story, Edward. Having sat through an hour of rain, I am so tempted to return to Sydney for a second viewing. It was that good. The indoor season starts next week in Melbourne, and I am concerned as to how it will look in comparison. I haven’t watched the film for a long time, I can only comment on the stage script, which definitely has Tony carried off stage. The powerful moment is meant to be that the Jets carry Tony and his body slips a bit so a Shark rushes forward to help. This is meant show the beginning of a reconciliation of sorts between the two groups.